Once completed, the Arbutus Greenway will transform a former rail corridor into a spectacular destination for all to enjoy. In the short term, we’ve constructed a temporary path for walking, cycling, and rolling. New traffic signals at four major street crossings — coming soon! Be a tourist in your own city. There’s something for everyone. 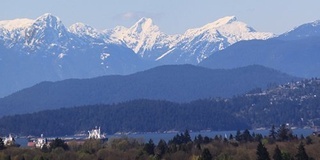 Explore the Arbutus Greenway and discover parks, neighbourhoods, and scenic views. Hop on a bike and be a tourist in your own city. Meet friends for a leisurely stroll. Enjoy coffee or lunch on a nearby patio. This park has accessible green space near the Burrard Slopes and Granville Island. This small park features a large children’s playground, partially shaded by the lacy leaves of tall locust trees. Quilchena’s wide green fields are welcoming to sports enthusiasts as well as those looking for a pleasant stroll. Public washrooms are available. This small but well-used park is tucked into a green corner of Marpole. Children enjoy both the playground and the central grassy area. With rolling lawns dotted with large, beautiful trees, Riverview Park is a peaceful place for a stroll. The temporary path runs along the eastside of Arbutus Street and West Boulevard for 8.5 kilometres between Fir Street and Milton Street. Download a printable a map (62 KB) to navigate the greenway's cycling and transit connections, parks, commercial districts, community gardens, museums, and more. Find a convenient route on Vancouver’s bike map (11 MB). West 10th Avenue, Nanton Avenue, and West 37th Avenue are just a few of your options. Nearby frequent transit corridors include Broadway (#99), King Edward (#25), West 41st Avenue (#41), West 49th Avenue (#49), and Arbutus Street/West Boulevard (#14). Limited on-street parking is available—for example, in commercial areas near West Broadway, West 41st Avenue, and West 57th Avenue.